Making pizza has been a bit of an obsession between we sisters. Twenty years ago, while Juliette and I and her son were living together in a new apartment complex in suburban Phoenix, we made pizza for the first time shaping the homemade dough on a perforated pan and baking the sausage and vegetable pie in an electric oven. I made the yeasted dough in a food processor using a recipe from Abby Mandel's Cuisinart Classroom (Cuisinart Cooking Club 1980) and prepared a cooked tomato pizza sauce from "The New Basics Cookbook" by Julee Rosso and Sheila Lukins (Workman Publishing 1989). Much has changed since then, but what has stayed the same is cooking pizza at home is a rewarding and fun experience. Living in Phoenix, where the intense summer blaze stretches six months, it wasn't long before we began cooking the pizzas on the grill, keeping the heat out of the kitchen and the house a little cooler. As an added bonus, the grill was hotter than the oven, giving the crust a better texture and taste. At that time I continued to use perforated pans set on the second rack of the grill to keep the crust from burning on the bottom. We could grill two at a time and pizzas became part of our standard recipe rotation for weekend dinners and casual entertaining. Over the years we've tinkered with various flour combinations and ratios of water, salt, yeast and olive oil. Somewhere in the neighborhood of 15 years ago, Juliette set her mind to learning about sourdough and made her own starter using the recipe from "Fields of Greens" by Annie Somerville (Bantam 1993). Seeing Juliette's success making gorgeous sourdough breads, I asked if she would give me, her dear sister, a portion of the starter. I've been refreshing and using it ever since. A few years ago, when Linda came to Tucson for a visit, I gave her a portion of the starter that she carried home to California where it is still alive and well in her refrigerator. I suppose we could just as well be called the Sourdough Salvation Sisters. You can probably tell where this story is going... it wasn't long before we began experimenting with sourdough pizza. I'd usually just add sourdough to my regular yeasted dough for extra flavor. It was Juliette who made the jump to cold fermentation - a long, slow rise in the refrigerator - for an extra tasty dough. She also happened to stumble across Jeff Varasano's website that introduced her to a process called autolyse (rhymes with analyze.) The way Jeff lays everything out is somewhat confusing, but all the information is there and explained in detail - just Google his name to find his site. The good news is that the autolyse technique works wonders with both yeasted and naturally leavened doughs and works just as well for pizza as it does for French bread. After further investigation, we discovered that the autolyse technique was developed by the late chemist and baker, Raymond Calvel who was a mentor to Julia Child. The method is used by bakers to make better bread with less work. It couldn't be simpler. Vigorously mix a portion of the flour and water together, and then let the mixture rest giving the flour time to absorb the water. 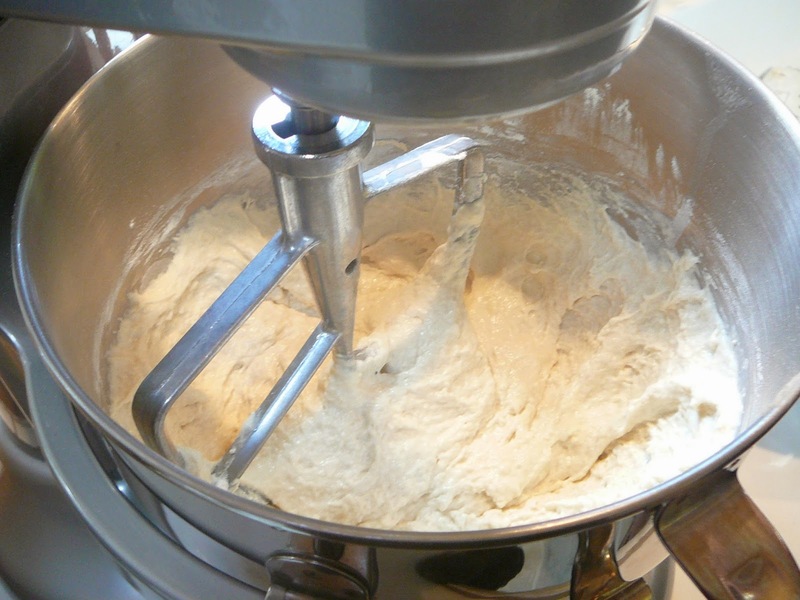 The result is the dough develops long strands of gluten and is more pliable. The dough requires less flour creating a wetter dough that is beneficial for baking pizza in an incredibly hot environment whether it is in an oven or on a grill. Light, but chewy crust, with big air pockets and it crunches when cut. Take a big bite, it's delicious! The autolyse technique has yielded such wonderful results that we have adjusted all our yeast bread recipes to incorporate it. For such little effort, autolyse yields great flavor and texture. With all the characteristics that folks typically want in an exceptional pizza - light, but chewy crust, with big air pockets and it crunches when you cut it or bite into it -give it a try and see the difference for yourself. Making great dough is certainly an important component of making a great pizza, but how the pie is baked is probably even more important - it has to be at a high heat and you must use a baking stone. If you have researched pizza making, you know that pizza ovens in Italy burn around 900°F, baking pizzas in about 2 minutes. Most home ovens top out between 450°F-500°F, baking a pizza on the downhill slide to 20 minutes after pre-heating for an hour. We estimate our grills on full throttle burn between 600°-700 °F, cooking a pizza in about 6 minutes giving the crust a slight char, called leoparding, and that crunchy but soft bite, which for us is highly desirable. 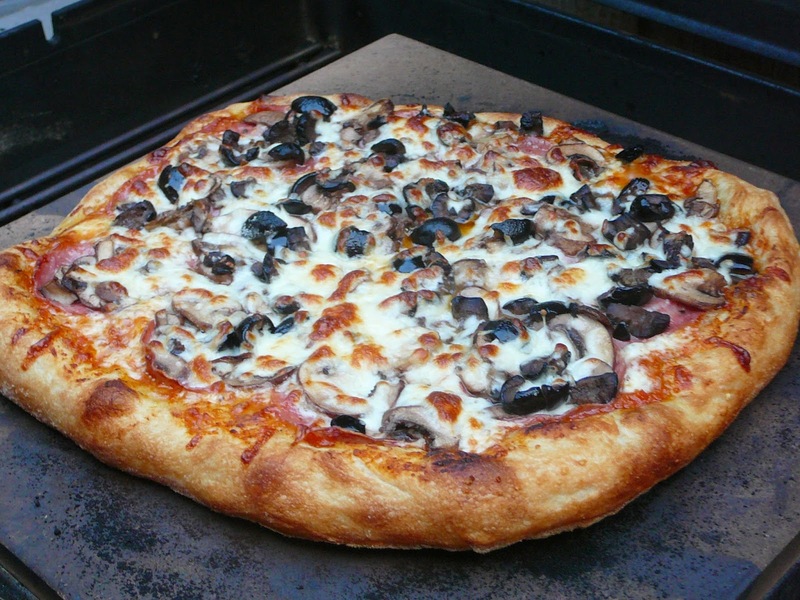 You can make excellent pizza at home using your gas grill, a pizza peel and a baking stone. Our best pizzas are baked using a Pizza Que Grill Stone, a baking stone that rests in a raised metal tray that sells via on-line and retail stores for about $90. The grill, with the stone, quickly preheats in about 10-15 minutes; much faster than a conventional oven. The Pizza Que can also be used in combination with smoking chips to provide extra smoky flavor approximating a wood burning oven. My only wish is that the stone will someday be available in a double wide version so we may grill two pizzas at the same time. Juliette continued on with developing her own incredible sourdough recipe that took a year and a half of diligent testing to perfect. She is now a pizzaoili in Bisbee, Arizona and cooks and bakes professionally for a living. We on the other hand, may wake up late on a Saturday and want pizza for an early dinner. If you are a patient person, the following recipe can also undergo a 24-hour rise in the refrigerator to maximize flavor. The choice is yours. Ready, set, go, let's cook pizza. This recipe was adapted from "Trattoria Grappolo" by Leonardo Curti and James O. Fraioli (Gibbs Smith, 2007). The lively bistro is located in the Santa Ynez Valley, our former home, nestled in the central coast of California, directly over the hills from Santa Barbara. "The Valley", as we refer to it, was brought to larger national attention by the film "Sideways". If you find yourself playing tourist in the area, walking through the windmill dotted village of Solvang, or wine tasting in the surrounding vineyards, seek out Trattoria Grappola for a meal. Chef Curti's Italian creations will surely make you swoon like us. The food is simply superb. 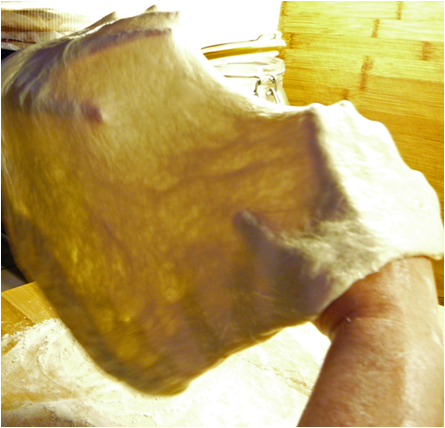 A bread baking technique called autolyse is the key step in successfully making pizza dough. 1. 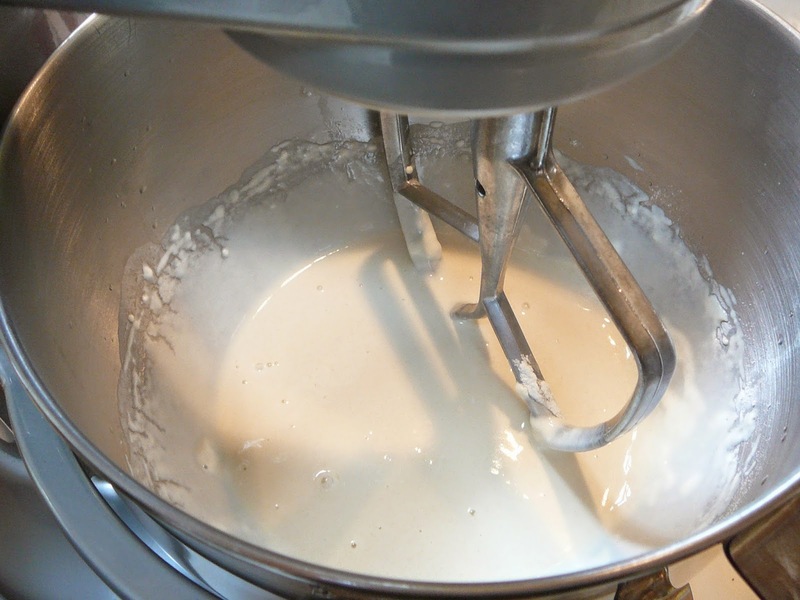 In the bowl of an electric mixer with the paddle attachment, add 1-1/2 cups warm water and 1/2 pound flour; mix vigorously for 3 minutes on medium speed. Allow to sit for 30 minutes. 2. In a measuring cup, with 1/2 cup water and a pinch of sugar, proof yeast until foamy and fully activated, about 15 minutes. 3. Add the yeast mixture, the olive oil and 1/2 pound flour. Mix vigorously for 3-5 minutes on medium speed until well combined. Allow to sit for 30 minutes. A second autolyse period includes the addition of activated yeast. 4. Mix 1/2 cup flour and salt together and add to the mixer bowl. Incorporate thoroughly. Mix the dough until it pulls away from the sides of the bowl; about 2-3 minutes. If necessary, add a little more flour, 1 or 2 tablespoons, until the dough pulls away from the sides of the bowl. Dough will be sticky. Turn dough out on lightly floured board, and knead for 2-3 minutes until dough is not sticky and light and airy. The dough will be sticky, which is a very good thing. 5. To make pizza later the same day: Put dough into a large oiled bowl, and rotate until covered with olive oil on all sides. Cover with plastic wrap and place in a warm spot until almost doubled in volume; about an hour. Lightly deflate the dough and fold the sides onto each other into a ball. Divide into 3 balls, 300 grams each. Discard leftover dough. Make pizza immediately, or refrigerate until ready to use, each dough ball stored separately in lightly oiled containers that hold 24 ounces or 710 ml. 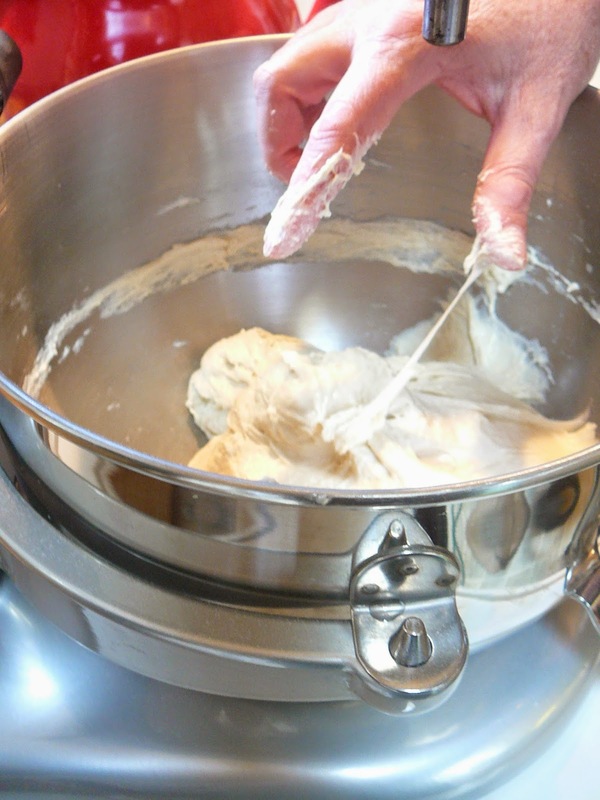 Transfer the "sticky" dough to a floured, flat surface. Knead for 2 to 3 minutes until a smooth, springy dough forms. 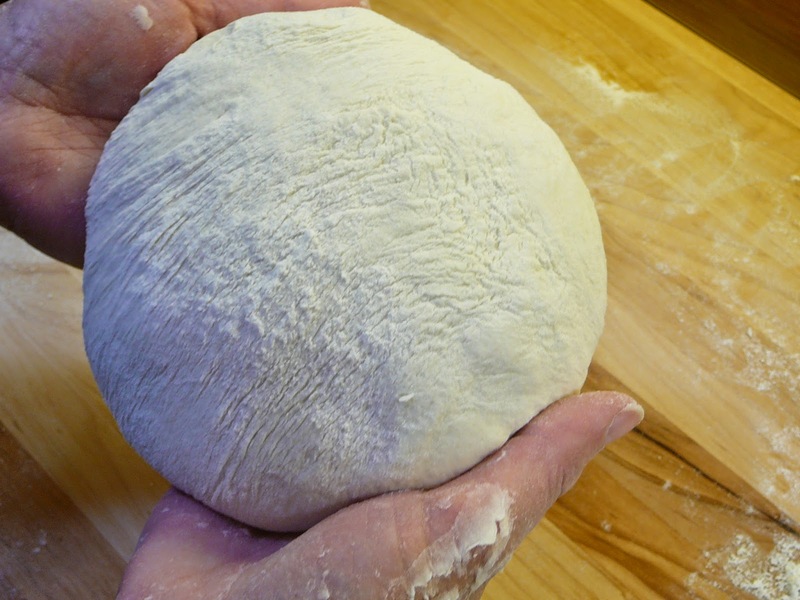 The dough will come together into a smooth ball. 6. To make pizza the next day: After kneading the dough on the board, cover it with a damp towel or inverted bowl and let it rest for 20 minutes. Divide into 3 balls, 300 grams each. Discard leftover dough. Store each dough ball separately in lightly oiled containers that hold 24 ounces or 710 ml. and immediately place in the refrigerator. About 1-1/2 hours before you are ready to make pizza, remove the containers from the refrigerator, and place on a counter to come to room temperature before using. 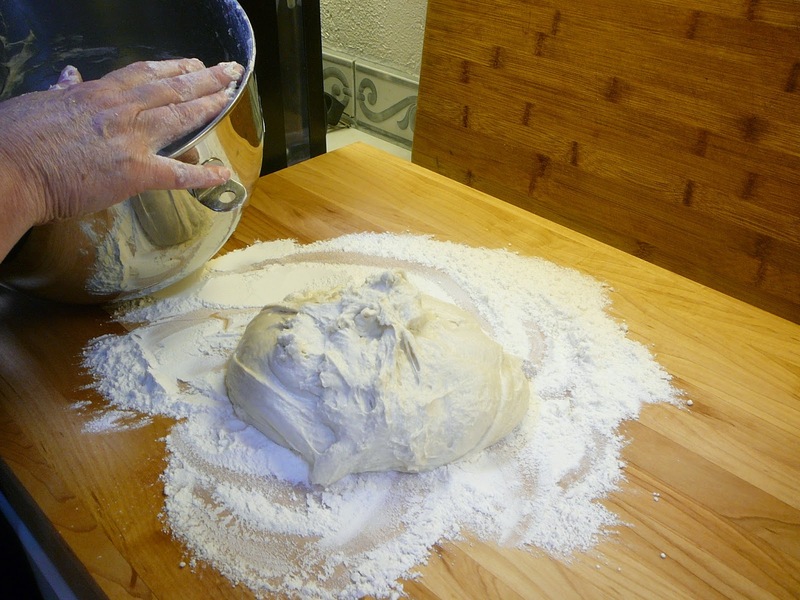 Let the dough rise in a covered bowl, gently deflated with a folding motion, then divide dough. 7. About 20 minutes prior to cooking the first pizza, place the Pizza Que on the grill, and light the burners. Heat on high. When you place the pizza on the stone, turn down the heat to 3/4 and keep it there. The Pizza Que directions say to cook over indirect heat, but that is not the case. Open the grill's lid as little as possible during cooking to retain the all important heat. Swirl together all-purpose or Mochiko sweet rice flour and fine corn meal on a pizza peel. 8. 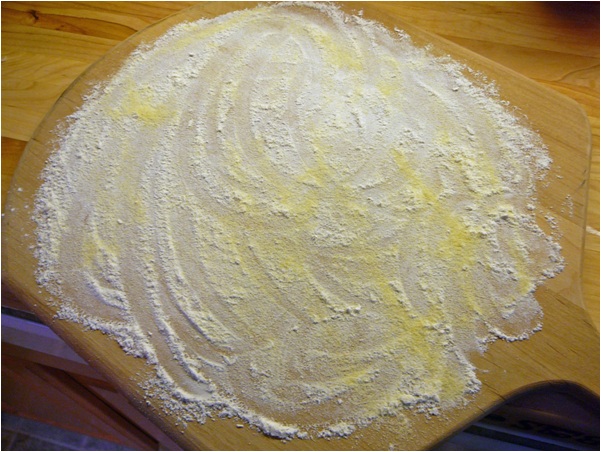 To make pizza: Generously dust a pizza peel with flour and sprinkle with semolina; set aside. Flour a wood board or flat surface. 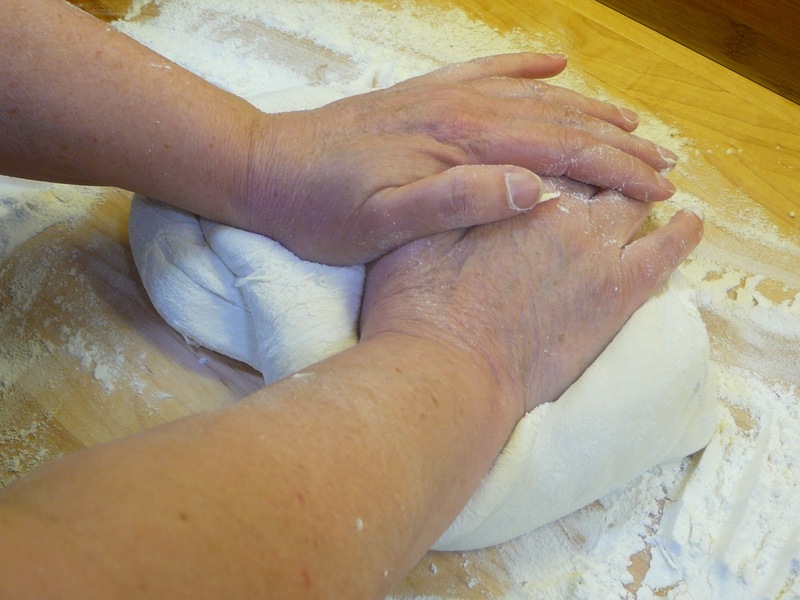 With floured hands, drop the dough ball on the back of your hands. Begin rotating and gently stretching the dough working from the center to the edge of the dough until it is about 6 to 8-inches in diameter. If the dough is resistant, let it sit for a few minutes allowing the gluten to relax before continuing. Place pizza on board, and push the dough from the center to the edges until it is about 10 to 12-inches across, thin through the middle and a nice crust accents the outer rim. With your hands, pick-up the dough and transfer to the peel. Reshape as necessary. To prevent the dough from becoming soggy from the sauce, brush the dough with plain or flavored olive oil. Give the peel a shimmy, every few minutes, to ensure the dough is not sticking to the peel. 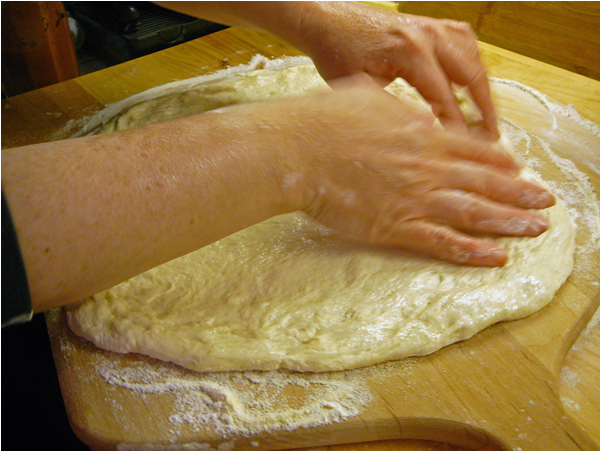 Stretch dough and then place on floured pizza peel; lightly brush olive oil to avoid a soggy crust. 9. Generally, this is our layering process for toppings: Spoon sauce over the crust that was brushed with olive oil, dust with grated parmesan cheese, sprinkle generously with shredded mozzarella cheese, add the toppings, and finish with a light sprinkling of cheese on top - careful not to add too much because cheese can burn in the intense heat. We should also note that most vegetables need to be precooked to evaporate excess moisture. Otherwise the top of your pizza might become rather wet during the cooking process, and will surely make the crust soggy after it is sliced. 10. To grill the pizza: Using the peel, immediately transfer the prepared pizza to the Pizza Que stone with a quick jerk (or two) of your arm and quickly close the lid. Check progress after about five minutes. Using a spatula, rotate the pizza to ensure even cooking. Cook until crust is golden brown, perhaps showing some leoparding, and the top is cooked. Turn again with the spatula, if necessary. With the assistance of a spatula, slide the cooked pie onto a perforated pizza pan. Cut slices and serve along side your favorite salad. Remember to offer chili flakes for extra seasoning. Buon Appetito! They are mostly out of all the fun colors on the sale items, but trust me when I say that they will be covered in flour most of the time anyway, so go cheap and live with the white. This was a great new way to try pizza! My dough had some interesting issues though, it never really stopped being sticky and when it came time to roll it out it had the consistency of melted mozzarella. Was my dough too wet? GREAT flavor, but it looks like I did something wrong in the kneading or something? Any advice you could provide would be greatly appreciated! Thanks! A little more information might be helpful... did you make and use the dough on the same day, or did you let the dough rest in the refrigerator for 24 hours? After kneading and the initial rest I divided it into three equal parts and let it rest about 18 hours in the fridge. I make homemade bread, sourdough, pizza, etc. I look forward to perfecting my pizza using this technique. Thank you for sharing this. Margaritas for You and Me or A Crowd, Por Favor!